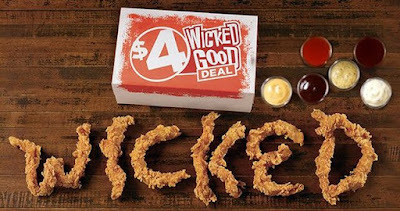 Popeyes brings back Wicked Chicken in a combo that they're calling the "$4 Wicked Good Deal." For $4, you get an order of Wicked Chicken, a side of your choice, a buttermilk biscuit, and a choice of dipping sauce. It's basically the same deal they've offered each time Wicked Chicken makes the rounds, but for one cent more and with a new name. Wicked Chicken features thin strips of chicken breast marinated in Louisiana seasonings and then battered, breaded, and fried. Because they're cut so thin and long, they twist up as they're deep-fried. The dish was first introduced back in 2010 and has been brought several times since (as well as in different flavors). 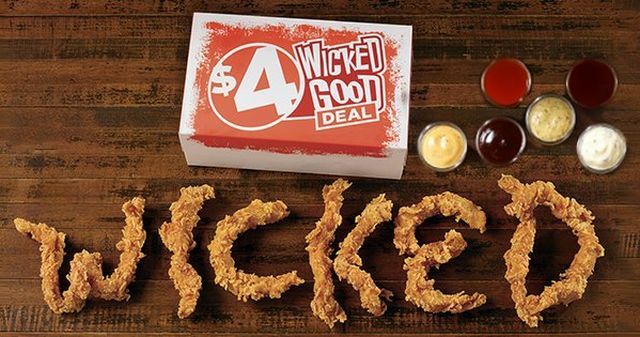 The $4 Wicked Good Deal (and Wicked Chicken) is available at participating locations for a limited time throughout the month of October.